The Trump administration laid out its plans to further integrate private sector health care into the services the Veterans Affairs Department provides for its patients, though the VA’s leader said he had no interest in full-scale privatization. VA Secretary David Shulkin at a Senate Veterans' Affairs Committee hearing called the new plan the Veterans Coordinated Access Rewarding Experience (Veterans CARE), saying it would overcome challenges that make access to private care arbitrary and cumbersome. At the heart of the new system, Shulkin said, would be allowing a veteran to call a VA doctor and decide in tandem whether to seek care in-house or in the community. If the veteran were seeking a service VA did not offer, if VA could not provide the service in a timely manner or if the local facility was failing to meet metrics for the desired service, the doctor would recommend a private facility. The system would move away from the current requirements that measure distance from a facility and wait times in determining whether veterans are eligible for community care, Shulkin said. VA’s “high performing integrated network” would, Shulkin said, include the department’s own facilities, federal partners, academic affiliates and community providers. VA would coordinate all of those networks and ensure they maintained patient satisfaction, adequate payment models, positive health care outcomes and a smooth exchange of health information. He also said VA will ease the process for veterans to receive urgent care. Shulkin acknowledged that there are some who wish to privatize the Veterans Health Administration. When the congressionally chartered Commission on Care issued its final report last year, for example, several members refused to sign on because they said it did not go far enough in pushing private care. The leader of that group, Darin Selnick, is now a senior adviser to Shulkin. Still, the secretary said he had no interest in privatizing VHA. He explained that some people have suggested the best approach is to give people a card or a voucher “and let them go where they want to go." (President Trump pitched this very idea on the campaign and the proposal still sits on his campaign’s website.) 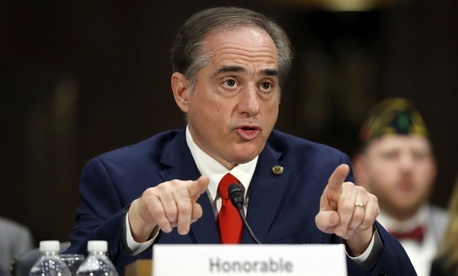 “Unfettered choice,” Shulkin said, “would lead to the elimination of the VA system.” He added it would leave veterans “out in the community with no one to help” and cost $20 billion more annually than the current system. He said he could envision a system such as the voucher idea someday, but not in 2017. Sen. Johnny Isakson, R-Ga., said the system Shulkin was proposing would in fact “put greater pressure on VA and VA health care.” He added no one on his panel wanted to “dissolve VA, do away with VA health care or close anything.” Shulkin has previously said he is looking to close hundreds of buildings, but is not focusing on medical facilities. Several veterans groups also testified at the hearing, where they generally supported getting rid of “arbitrary” requirements to qualify for private care such as distance from a facility or wait times as long as it was not funded by taking away from earned benefits. They also emphasized that VA’s own services must improve side-by-side with the private sector integration.